Far Cry: New Dawn has a clutter of deficiencies that wouldn’t be so egregious if they weren’t the mirror image of the same issues that plagued Far Cry 5. 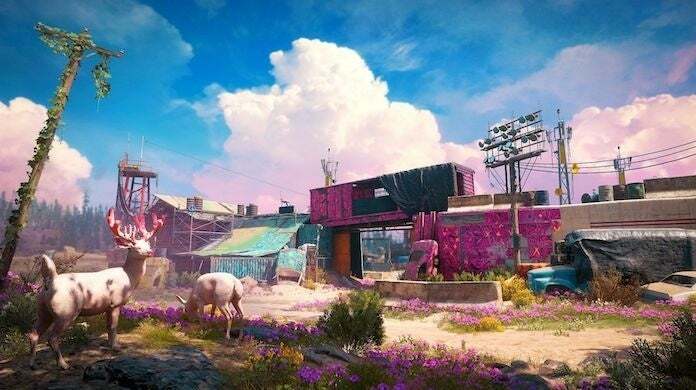 But Far Cry: New Dawn can’t even boast being a colorful replica of the game before it, because what made Far Cry 5 palatable -- it’s characters, atmosphere, and exemplary soundtrack -- is either worse or completely absent in Far Cry: New Dawn. What stuck out most to me while playing the abbreviated Far Cry experience though is its somewhat paradoxical premise. It’s pitched as a standalone sequel, but it scarcely feels like one. The story and characters are not even compelling having played Far Cry 5, let alone in a vacuum. But worse yet, the anti-climactic finish of New Dawn, and of certain character arcs, makes me like Far Cry 5 less and further demonstrates that Ubisoft doesn’t have a good sense of how to evolve the series after the modern peak of Far Cry 3. Far Cry: New Dawn feels like its torn between whether it wants to be a standalone experience or just a continuation of Far Cry 5. At times it leans into being a zany post-apocalyptic Far Cry that double dips in the madcap roots of the series, like Blood Dragon. And then at times it feels like, after seeing the success of Far Cry 5, someone up the chain of command walked into the room and asked, "Where the heck are the cult dudes?" Ubisoft never makes a full commitment to continue or leave behind Joseph Seed and his story, and the result is a middling experience that isn’t complementing or additive, but inconsequential. This is best represented in the game’s story, which is set 17 years after the global nuclear catastrophe that capped Far Cry 5. Thanks to preppers and some savvy survivors, Hope County is finally rebuilding a new life in a world completely transformed by the blast and the radiation it left behind... until the Highwaymen show up. The Highwaymen are a collection of vicious scavengers who travel from place to place and trade carnage for resources and power. They’re loud, violent, remorseless, and do everything in vibrant, colorful fashion while listening to music your grandfather would find detestable. This particular chapter is led by twin sisters Mickey (the brains) and Lou (the muscle), who set the deranged and brutal standard by ruling with a cold, iron fist. They also may be the worst Far Cry villains yet and embody the larger issue with the series at the moment. Once you’ve looked into the eyes of Vaas and seen the definition of insanity, sat at a dinner table with the unpredictable Pagan Min, or heard a sermon from The Father, the twins stick out not only as juvenile and harmless, but nothing more than mimics of those that came before them. On their own, they are probably pretty compelling antagonists, but Ubisoft has beaten the unhinged villains angle to death at this point. With similar traits and similar arcs, the twins feel comfortably familiar, a jarring juxtaposition to their nature. 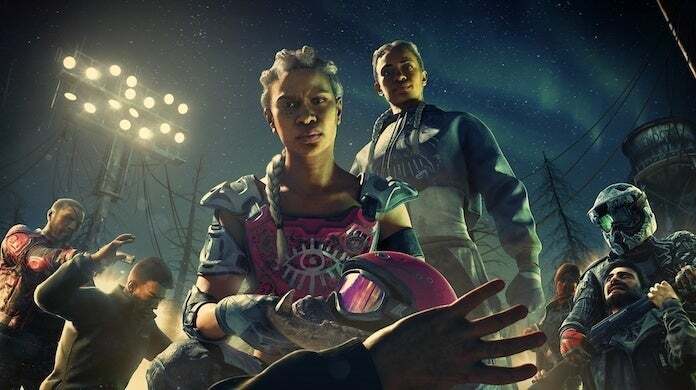 Far Cry: New Dawn's story isn’t as disjointed as Far Cry 5’s, however, thanks to its concentrated and less open-ended storytelling approach, it suffers from poor narrative structure, which is a shame, because the writing is strong. Because of its length, by the time New Dawn’s story hits full steam, it’s basically over. And this is partially why the parts of the story -- the exposition, rising action, climax, fall action, and resolution -- feel so poorly disguised. It comes across very formulaic, but worst of all the classic Far Cry revenge quest is let down by the most predictable plot points and clumsy foreshadowing. And it all culminates in a very anti-climatic finish that feels hastily put together and undermines the events and characters of Far Cry 5. Balancing the shortcomings of the story is classic Far Cry gameplay. Like the games before it, New Dawn is a playground of chaos. Its open-world is not only ripe with opportunity to fulfill the power fantasy of shooting things and making things go boom, but there is some very tense combat sequences punctuated with some literal laugh-out-loud moments as you try and survive in the epicenter of a storm of mayhem. In other words, it still plays like a Far Cry game. Around the edges, New Dawn makes some strides for the series, but also flounders in poor individual design decisions. Like Far Cry 5, New Dawn features a silent protagonist that feels clashingly out of place. It hurts immersion, it hurts the narrative, and undercuts all emotional resonance as you run around as a characterless and colorless empty vessel. There’s not even branching dialogue or decisions to define your character to subsidize this either. It’s a puzzling design choice that I hope doesn't stick with future installments. Meanwhile, the guns for hire (companion) system also continues to feel almost comically rudimentary. If it weren’t for its horrible scripting constantly rearing its head with the most unfortunate timing, you wouldn’t even notice they were there. The humans are so devoid of consciousness that it can be incongruous at certain moments in the game, which is why the only real option is to roll with an animal companion (Horatio). New Dawn does have its positives, though. For one, it pads out its locker of content with new features like Expeditions, which are missions that take place outside of Hope County and take you to places like a massive warship and into swamplands. The missions are a bit one-note, and they don’t deviate from the core game structure too much, but they are nice distractions and breaks from doing outposts and treasure hunts over and over (and over) again. There's also a home base -- dubbed Prosperity -- where all your forces hang out, interact, and mostly do nothing while you slaughter everything that breathes at you the wrong way. You won’t be dumping any time into just casually hanging out or chatting with NPCs like you would other games, but you can upgrade the base to craft better weapons, level up your guns for hire, and more. It’s hardly a robust feature, but it adds a nice layer of dynamism and elevates your connection to the people and area you’re fighting for. However, it has seemingly come at the expense of gun customization, which is a massive bummer. What’s also a bummer is that while Far Cry 5 has one of the best soundtracks of this generation, New Dawn’s original soundtrack never breaks past being background noise. Where Far Cry 5’s rendition of "Amazing Grace" still delightfully haunt me to this day, all I’ll remember New Dawn’s soundtrack for is the music the Highwayman blare everywhere they go. And while I appreciated frantically running around to Run the Jewels at first, having to listen to the workout playlist of every 15-year-old boy who’s really getting into working out for the first time became unpleasant real quick. 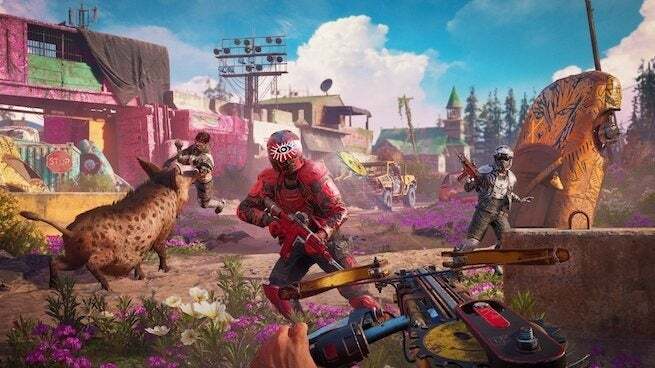 Far Cry: New Dawn is just more Far Cry with a new coat of paint that looks someone threw up Fun Dip and energy drinks everywhere. “More Far Cry” has always been a fine selling point for me, but the returns diminish every time Ubisoft churns out a new one with insignificant changes. And when you factor in that New Dawn stumbles and fumbles where other games in the series don’t, not only is it hard to recommend for anyone who’s never played the series before, but for fans of it too. It's "fine," but never rises to "good" or "great." Ultimately, it's unfortunate that the most colorful and vibrant Far Cry yet is also the most monochromatic. 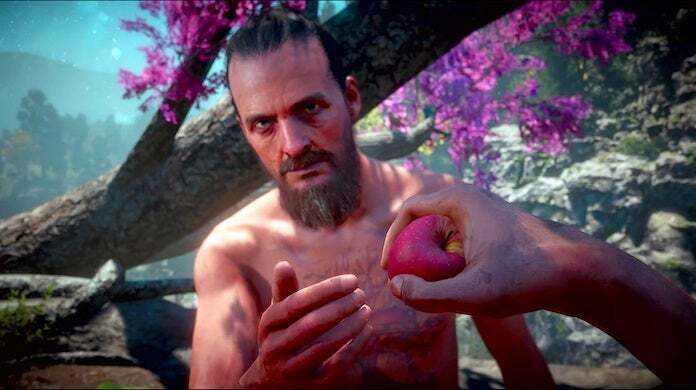 Far Cry: New Dawn is available on PlayStation 4, Xbox One, and PC for $39.99. A PS4 code was provided by the publisher for the purpose of review.